Those resorting to communal politics have not only perfected their techniques of polarizing the communities along religious lines, but have been constantly resorting to new methods for dividing the society. On the backdrop of Muzzafar nagar, where ‘Love Jihad’ propaganda was used to enhance the divisive agenda, now in Aligarh an icon of matchless virtues, Raja Mahendra Pratap Singh is being employed for the similar purposes (Nov 2014). The attempt by BJP and associates to hold the memorial function in his honor within campus was successfully deflected by the Vice Chancellor of the Aligarh Muslim University (AMU) University with the plan for a seminar befitting his contribution to the freedom movement of this AMU alumnus. BJP dug up this icon from pages of history and gauzing prevalent respect for him after the lapse of decades after his death. The answer to why now at this particular juncture is very revealing. Mahendra Pratap died on 29 April 1979, and now out of the blues BJP seems to have felt that his Jat, Hindu identity can be pitched as a flag of their politics. Pratap was a freedom fighter extraordinary, a journalist and a writer. He was a humanist, believing in International federation of nations transcending the national and religious boundaries. He was a Marxist who called for social reforms and empowerment of Panchayats. He was president of Indian Freedom Fighters' Association He was also the first one to form the provisional Indian Government in exile by establishing it in Kabul in 1915. Just to recall the Indian National Congress adopted the goal of complete freedom for India much later in its 1929 session. This Provisional Government was called Hakumat-i-Moktar-i-Hind, and was constituted with Pratap as the President, Maulvi Barkatullah as prime minister and Maulana Obaidullah Sindhi as interior minister. After independence he also participated in the electoral arena where he defeated Atal Bihari Vajpayee in Mathura in the 1957 Lok Sabha election. His commitment to being opposed to communal forces could not be more evident than this opposition of his to the leader of Bhartiya Jansangh, Vajpayee. Ironically same person is being lifted up as the icon, who opposed their politics. BJP leaders like Yogi Adityanath are claiming that had Mahendra Pratap not donated the land the AMU would not have come up. This is contrary to the facts. The predecessor of AMU, Mohammadan Anglo Oriental College was formed in 1886, with a land bought from British cantonment (Nearly 74 Acres) and much later Pratap had leased 3.04 acres of land, this is called Tikonia ground and is used as a playground by the City High School of AMU in 1929. He joined the Mohammedan Anglo Oriental College in 1895, but could not complete his graduation. He left MAO College in 1905. MAO became Aligarh Muslim University in 1920, which regards Raja Mahendra Pratap Singh as an alumnus. In 1977, AMU, under V-C Prof A M Khusro, felicitated Mahendra Pratap at the centenary celebrations of MAO. He wasn’t born when MAO was established, and there is no record of any donation of land from him. Mahendra Pratap’s father Raja Ghanshiam Singh of Mursan had got a hostel room constructed, which continues to stand as Room Number 31 in Sir Syed Hall (South). BJP demanded that Mahenra Pratap’s birthday should be celebrated as AMU celebrates the birthday of Sir Syed, the founder of the University RSS Functionaries and BJP leaders put pressure on the VC. VC pointed out that AMU cannot celebrate birth day of every donor or alumnus, while recognizing their contribution to the building up of the University. As such already AMU in recognition of Pratap’s contribution to the University has put up his photo in University along with the photo of Sir Syed. On November 17 (2014), BJP chief of UP Mr. Laxmikant Bajpai and general secretary Swatantra Dev Singh visited Aligarh and directed their district unit to celebrate the birth day of Mahendra Pratap’s within the MU campus. The raja is a also Jat icon, In popular perception AMU is seen as a Muslim institution. The Jat-Muslim conflict instigated by communal forces, which erupted in the form of violence in Muzaffarnagar continues to affect in western part of UP. The BJP through its machinations allegedly wants to restore the glory of a Jat ‘king’. As such the idea is to appropriate one more of icons and in the process if the state government puts curbs on the celebration, the BJP can benefit by accusing the state Government of “Muslim appeasement”. As the matters stand VC, Gen. Shah’s suggestion of celebrating the birth anniversary of Raja Mahendra Pratap by organizing a seminar on his contribution to freedom movement of India is a welcome initiative. The situation seems to have been diffused for the time being. BJP had planned a rally outside the gate of AMU, which would have precipitated the unwarranted incidents. This whole episode has many lessons for the society. To begin with, the national icons are being modulated to suit the interests of communal politics. Be it Sardar patel, Swami Vivekanand, Mahatma Gandhi or in this case Raja Mahendra Pratap, they are being presented in the light which suits the communal politics. 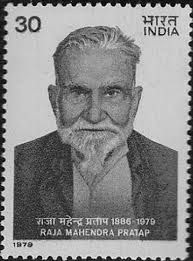 In case of Mahedra Pratap, who was a Marxist internationalist; is being presented as a mere Jat leader. He was a person who opposed the politics in the name of religion, as is evident by his electoral fight against BJP’s previous avatar, Bhartiya Jan Sanghs’ Atal Bihari Vajpayee. Secondly BJP associates are manipulating people’s identity as primarily being religious identity, Hindu or Muslim. In case of Muzzafarnagar, the Jats who were instigated in the name of ‘love Jihad’ came to stand more for Hindu identity. This identity is then made to stand opposed to the ‘other’ religious identity in particular, the Muslim identity and sometimes Christian identity. Same game is also being experimented in parts of Delhi, where Dalits are being made to pitch against Muslims, in a way two deprived communities being made to fight for’ their’ religion’ on the pretext of some issues related to faith. The communal politics not only manipulates the identity of the people but also that of the icons, as is clear in the case of Raja Mahendra Pratap. The third major lesson for society to learn is that the search is on to find more and more issues to pitch one religious community against the other to strengthen the politics of a particular type. While the top leadership will talk of moratorium on violence, the associates of the same leadership will stoke the processes which will lead to the process of violence in due course. A great amount of restraint is needed to ensure that we learn the values of the icons, e.g. the likes of Mahendra Pratap teach us the basic lessons of love and amity, peace and universal humanism. To use the techniques of conflicting religious identities is a gross violation of human morality, irrespective of the religion in whose name it is done.